The Kindred: predators and monsters to the last. A race of biblically cursed parasites, these vampires hide among humanity, eking out a damned existence under the eyes of God and the noses of mortals. Each night, the Kindred steal forth to take the sustenance they need for their continued survival - human blood. 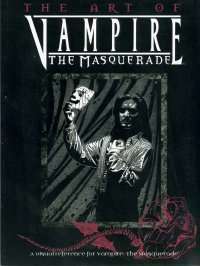 The Art of Vampire: The Masquerade comples the most noteworthy illustrations from the critically acclaimed storytelling game. Spanning eight years and more than 60 books, the Vampire game features artwork by top industry illustrators and talented up-and-comers alike. From the early look of the game, back 800 years into the Dark Ages, and returning once again to the modern nights, this book is a beautiful chronicle of the evolution of the vampire.